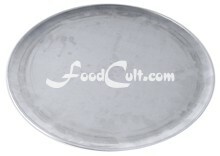 Pizza Pans and Utensiles - Free, Easy Recipes @ FoodCult.com - A Place for Galganov's Recipes and More - Food Matters! If you have any passion for Home Made Pizza this page will give you a little insight into the tools for a great, home made pizza pie. 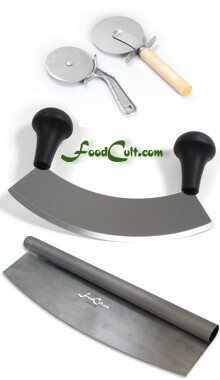 There are numerous pizza tools ... and some, while pizza specific, are adaptable to other purposes. The pizza stone, for example, can be a fantastic medium for baking many rustic style breads. French bread which is traditionally baked on a tile or slate surface may, also, be baked on a (pizza) stone. We like to reheat pre-fried samosas on a stone (we wipe the residual grease off the stone using a dry paper towel - sometimes scraping, carefully, with a knife, after it's cooled). The stone is also an excellent baking surface for crackers and bread sticks! A pizza wheel (rotary knife) is also pretty good way to cut dough for crackers. We do not believe pizza wheels can be sharpened but they are sufficiently inexpensive AND are so common-place that there is little reason to want to go through the effort of sharpening them. Electric pizza wheels are, in our opinion, a waste of money and electricity (or batteries). We've never seen a powered pizza wheel in a pizzeria (pizza restaurant). If such a restaurant which cuts hundreds and even thousands of pizzas every week uses a manual wheel - well, what more need be said! We know there will be many other uses for some of the utensiles found here ... ideas are limited by your own needs and imagination. New stones come in a range of colours, sizes and shapes. They can be light grayish-tan to deep yellowish- (or almost orange-) tan. They can be round or square ... or even rectangles. They can be 8" diameter round or they can be 16" square. They may even be 7" x 16" rectangular. They can be larger than the sizes cited here or smaller but all pizza stones have a few things in common. They will all be a great surface for baking pizzas (and other foods). They will all darken (AND improve) with use. They will always be porous. All cautionary notes and all advantages cited on this page will be characteristic of any pizza stone regardless of size, colour or manufacturer. Never put a stone into a hot oven. Always put your cold stone into a cold oven. A cold stone in a hot oven will crack. Never apply water to a hot stone. Don't ever use any sort of soap or detergent on your stone. Pizza stones are highly absorbant and will readily take soap into them. Manufacturers generally suggest not washing a stone at all. We will, occasionally, use a lightly dampened piece of paper towel to wipe our stone down and then wipe it dry with a clean piece of towel. Don't use running water on your stone. A slightly dampened cloth or paper towel should be the maximum (remember, if you use a cloth, it will turn brownish black from residue as on this well used/seasoned stone). Manufacturers often suggest using a spatula to scrape the stone. We disagree. Your pizza stone is a wonderful surface which will easily put a sharp edge on your spatula. Since a sharp spatula is entirely unexpected it can be dangerous and the potential for inadvertently cutting yourself on a sharpened spatula is high. We suggest gently scraping the stone with a knife (being careful to not gouge the stone) since a sharp, cutting edge is expected. On a less expensive knife (a softer metal) it may even help to give the knife a nice edge (but remember, this is not a sharpening stone - we do not recommend it be used for the purpose of sharpening knives). Do not use a pizza wheel to scrape your stone. A pizza stone will store nicely in its native place on the bottom rack inside your oven. We have not tried (and are not suggesting) leaving it there during a cleaning cycle. Our stone is almost always on the bottom shelf of our oven - being moved only when that shelf is needed for something which would not be advantaged by the presence of the stone, or to clean the oven. 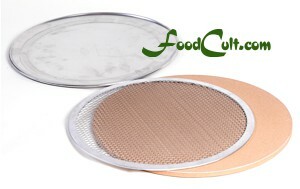 For a long time we used the Perforated Pizza Pan. It was our favourite pan on which to bake pizza. It sits directly on the stone, the large holes allowing humidity to be sucked from the crust into the stone creating a drier, crisper crust. The Pizza Screen (a little harder to find) also sits directly on the pizza stone. Because there is so little metal between the pizza and the stone, the stone will absorb more humidity creating a nicer, crisper crust. After having tried the pizza screen, the perforated pan (referenced above) became our second favourite pizza baking surface - replaced by the screen. Like all other pizza baking surfaces (except the stone) the pizza screen must be oiled. It does, however, use less oil than the perforated (or any other) pan and is quite easily cleaned with a soapy brush. The only down-side to the screen is you must not cut pizza on it. Consequently you must remove the pie prior to cutting and serving, to a pizza pan (the kind on which pizzerias serve their pies) to cut. The screen is also the easiest to work with if you would like to finish your pizza on the stone (bake the last 3 to 5 minutes on the stone). It is fairly easy to free your pizza from the screen and slide it onto the stone for finishing. In this case, when finished baking, use a spatuala to push the pizza onto a pizza pan where you can cut and serve your meal. The Standard Pizza baking pans - generally come in aluminum and may be treated with a non-stick surface. We never use non-stick coated (ie, teflon) cooking surfaces. If you are using a standard (non-perforated) baking pan and want a softer crust double up your pans to create an air pocket between the pans. Baking your pizza on these stacked pans will yield a softer crust. If you want a crispier crust, don't overlook this standard pan - simply line it with parchment paper. Parchment paper means "no extra grease and super easy handling"
The sheet pan (a common cookie sheet with sides) also works well. The best option with this device is, as with the pizza pan, to line it with parchement paper - eliminate the need for extra oil and make it easy to move around after ... and you can cut directly on the parchment paper! The Deep Dish Pan - has sides which rise perpendicular to the base anywhere from about 1" (2 cm) to 2" (4 cm). 1 1/2" (3 cm) deep dish pans are not entirely uncommon. Some like, even, up to the 2" (4 cm). We call that a "cake pan". Deep Dish Pizza is also known, sometimes, as a "Chicago Pizza". The cast iron pan comes in a variety of styles. One pictured here is shiny enamel on the outside and black matte enamel on the cooking surface. It is billed by the manufacturer/distributor as going "... from o ven or stove to table" but you must use a trivet to protect your table from burns from the hot griddle/pizza pan and you must use oven mitts. One must not cut on it in spite of it being "oven to table". One still needs a solid pan or suitable board to cut on. It's nice for making Instant Pizza on Pita and lightly burnt on cheese cleans with a soaking and gentle scrubbing with a soapy, nylon pot scrubber. The other, this one, is true cast iron. This pan will yield a crust with a very slightly breadcrust dry surface (very handy for holding) - excellent for thin crust pizza! The pan is seasoned (has a coating of oil burnt on) to create a non-stick surface. This pan is truly oven-to-table but, once again, a trivet and oven mitts must be used lest you burn your hands and table. Cast iron is highly effective at retaining heat and, so, can be dangerous if you are not careful. The cast iron, on the other hand, will not damage from cutting on it. At very worst, you may need to re-season this pan. Of course, one may choose to transfer a baked pizza from the cast iron to the lighter weight, cooler, standard aluminum pan for cutting and/or serving. The seasoned cast iron, like its enameled counterpart, is effective on the stove top or in the oven. I would even try it in a fire pit (just don't cool a hot pan with water. Let it cool down a bit first). One fan of our pizza recipe swears by the cast iron - reporting that he has enjoyed years of excellent pizzas on his cast iron pan. Cleanup with this beauty is (by an adult) with very hot water and a scouring pad or brush only. One never needs soap - soap will wash away the seasoning which, in addition to creating the above-mentioned non-stick surface, also protect the iron from rust. A cast iron pan can last generations - being passed down in families. 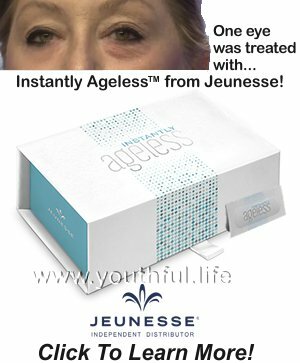 Don't abuse it - it just won't die! 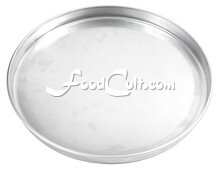 *Always apply a very thin coating of oil just before storing your pan in a dust-free place. The pan shouldn't require oiling before next use and will help to maintain a rust-free, non-stick surface. Not pictured here is the silicone pizza pan. This would have to sit on a cookie sheet and would likely make a very soft crust ... and one certainly couldn't cut the pie in a silicone pan. The Pizza Peel - is a great, big spatula used to move a pizza from the counter where it is formed to the floor of a pizza (or brick) oven and back to a pizza pan for cutting and serving. Peels are either, typically, aluminum or wood. Some wood peels have a "target" on them (like the one pictured here) indicating different pizza sizes. In this case, the baker may prepare the dough directly on the peel using the "target" as an aid to size the dough (ie, to stretch dough for a small, medium, large, etc; pizza). This wooden peel has a 22" (56 cm) handle and a 20" (51 cm) blade. Not all wood peels have targets on them. Pizza peels with longer handles (as this one with a 34" [86 cm] handle and a 16" [40 cm] blade) are usually used with larger/deeper, commercial (pizza restaurant) ovens so the baker can easily get the pizza into and out of the back of these deep, pizza and/or (often wood-fired) brick ovens ... or to move the pizza around the oven to expose the pie to the varying temperatures of that oven. Since most home bakers don't have the space to slide a pizza on and off the rather small consumer stones (not ignoring, additionally, the skill and practice it takes to move the pizza around that way), a peel is not an entirely practical/useful accessory for the home pizza maker. The Pizza Pan is used in most pizza restaurants to serve the pie at the table. This is a MUST if you are using a screen since one must not cut a pizza pie on a screen (it will damage the screen). A pizza pan is an advantage when baking on the perforated pan since, while you can cut on the perforated pan, some mess will occur as some crumbs and toppings are bound to fall through the holes in the perforated pan so stacking the perforated pan on the pizza pan - after baking - will help keep your kitchen (and dining table) a little cleaner..
Pizza knives come, essentially, in two forms. One is the pizza wheel (two varieties shown here) and the other is the pizza knife. Pizza wheels are cheap and readily available at almost any store carrying kitchen wares. Growing up, all pizzerias in our home town (and there were an abundance of them) used wheels. They come in many forms - they may have metal or wooden handles. Some have cushioned grips. Essentially, they all do the same thing. You run them across the pie to cut through the layers of topping ... and the crust below. The other option is the pizza knife. Pizza knives may be as short as 14" (35 cm) or less to 22" (56 cm) or more. As the one shown here, they typically have a blade with a large arc to rock easily and will generally have a handle at either end. While this knife features two large, knob-type handles, different knife manufacturers use different types of handles - but the principal is the same. Consumer knives (such as the rolled steel knife) are very inexpensive and have virtually no blade (they are very dull) but will cut through a pizza with relatively little effort. The one shown here was purchased from a dollar store. These knives, when sharp, are exceedingly dangerous. We are pefectly happy with our 10 year old pizza wheel ... and when it no longer works well we have a backup that came, for free, with a stone. We don't, by the way, ever cut our pizzas on the stone. We always leave the stone in the oven. We transfer the pie to the pizza pan and cut it there. Pizza tools, for us, has been a progression just as the pizza doughs have been. We started in the mid 1980's buying wonderful pitas (now home made), dressing them up like pizza and tossing them on a baking sheet. Gradually, the pita bakery began to sell product out of the freezer instead of the fresh bags of bread we saw coming off the delivery system and we no longer felt it worthwhile buying from them so, without a satisfactory pita supplier for our instant pizzas we took to considering making our own crusts. We found a recipe clipped from the Montreal Gazette back in the 1950's. We would make the recipe and divide it into two - baking one on an aluminum pizza pan, available in any retail store, and enjoying that while freezing the other on a second pan - for later consumption. The pizza recipe evolved and so did the pans we used. We found, one day, the perforated pan. This was a great boon to our home made pizzas. The perforated pan had, of course, to be stacked on a solid aluminum pan or sheet to help reduce messing the oven. Then, one day, we saw a pizza stone at a retail store and thought "This will be HUGE ... we can put our perforated pan directly on the stone and let the stone take some of the humidity out of the crust." It was wonderful ... and after a short while we were sliding the almost cooked pizza off the pan and onto the stone for finishing ... getting as close to a pizzeria crust as anyone could get. This went on for years until, one day, we wandered into a kitchen supply store, open to the public, that catered to commercial kitchens ... and discovered the pizza screen. Today our pizzas are as good as (and generally better than) commercial pizza restaurants. Pictured below is a set of our favourite, single-serving pizza baking utensils: a 13" (32.5 cm) pizza stone and serving pan, and a 12" (30 cm) pizza screen. (While 13" [32.5 cm] screens are available, we chose a slightly smaller screen to facilitate easier handling on the stone.) The stone pictured here is new and will colour, like all pizza stones, with use. In fact, a seasoned stone works better (but a seasoned stone continues to be porous and, so, must be handled with this in mind, ie, no soaps, etcetera). Pizza-holic? Get Pizza Wallpaper for your desktop!